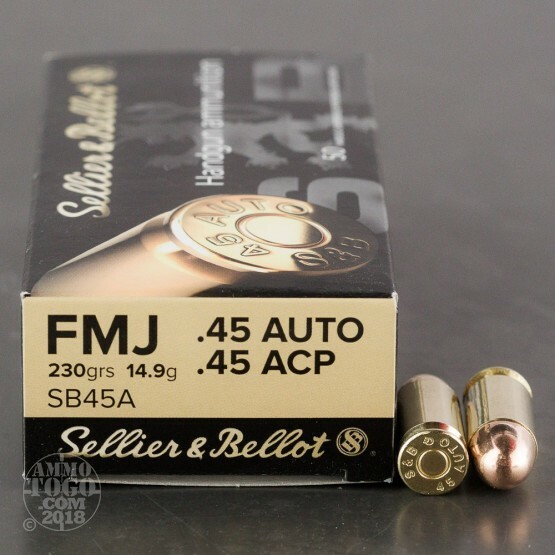 All Sellier & Bellot ammunition is held to exacting tolerances in diameter and weight, which results in consistent accuracy and reliable function with every shot. Manufactured in the Czech Republic using cutting edge machinery and technology, the accuracy of Sellier & Bellot ammunition is highly acclaimed. 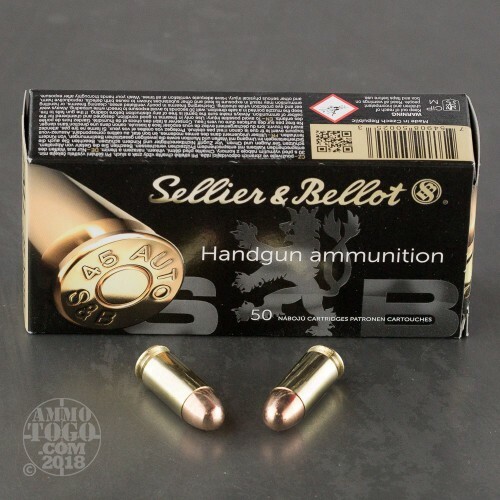 This package contains 50 rounds of Sellier & Bellot .45 ACP (Auto) ammunition. Each cartridge is loaded with a 230 grain full metal jacket projectile. Producing minimal terminal expansion, these loads are ideal for target shooting, tactical practice, and casual backyard plinking. This ammunition is factory fresh, boxer primed, and brass cased. Non-corrosive and packed in special oil-resistant boxes, these loads have an extended shelf life and are perfect for long-term storage. Each round produces a consistent muzzle velocity of 853 feet per second and a muzzle energy of 372 foot pounds. S&B 45 ACP 230grs FMJ SB45A is very reliable, accurate and affordable practice and carry ammunition out their,I recommend S&B Ammunition in any caliber for target practice and carrying over any other brand other than Hornady critical defense or zombie.Try both of these and you will never buy any other ammunition again. Great ammo Great price. Primer pocket needs reamed if you want to reload, which is a pain by hand. Fired 50 rds through a gun out of the box new gun. After 50 rds, no FTF, FTE, or any other issue. I did try some steel case rounds I had laying around and it did FTF. So for the minimal cost between Sellier & Bellot and the steel cases, the choice is easy. 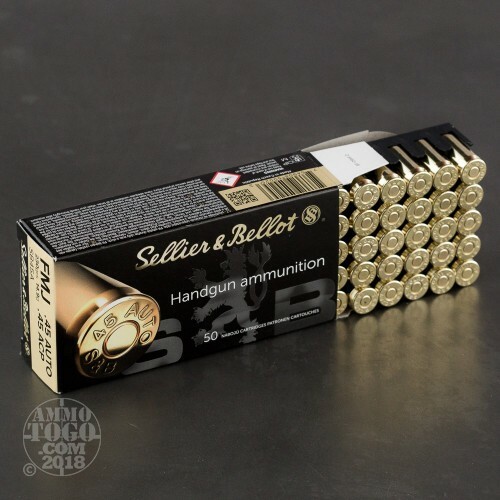 This ammo shoots great and has a nice price. I will make this my standard practice ammo. I've had no problems with this ammo. This is the only ammo that I practice with. I either purchased a bad batch, or this ammo is junk! Out of 150 rounds fired, 25 were misfires! A 230 FMJ that hits a bad guy does more damage than a fancy advertised JHP that snags on the feed ramp. This is great plinkin' ammo. It shoots straight, the brass is great, and the price is right. This is good ammunition. Rated at 850fps it is a full-power load for the .45ACP. Compare to WWB at 830fps. I have never had any problems in any of my guns with this ammo. The brass is reloadable too. 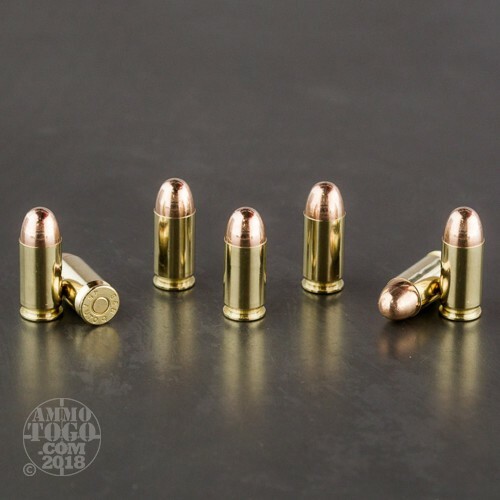 I have reloaded this brass several times without any problems.